‘This is to certify that we, the parents of Wesley Paul Choat, do hereby consent to his proposal of joining the forces for the sake of King & country’. "...he has been officially reported missing; we received that news in January, if we could hear that our dear Ray is alive somewhere we should be so thankful, the 20th of July was a sad day for us, our Archie was killed, Wesley taken prisoner, & Raymond missing since that date." On 12 August 1917 a Court of Enquiry held in the field pronounced Raymond killed in action on 20 July 1916. 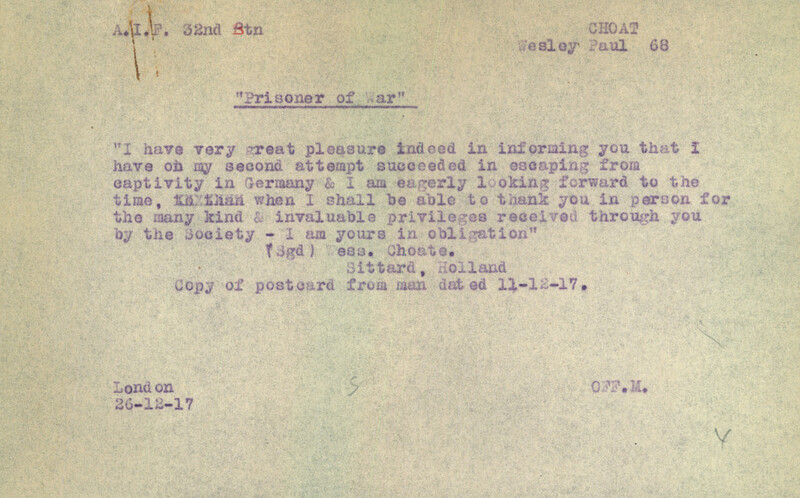 "I have the very great pleasure indeed in informing you that I have, on my second attempt, succeeded in escaping from captivity in Germany & am eagerly looking forward to the time, when I shall be able to thank you in person for the many kind and invaluable privileges received through you by the Society – I am yours in obligation." Choat and his family petitioned the A.I.F. for him to be returned to Australia or at least put in service somewhere away from the frontline. He was returned to Australia in May 1918. In July 1918, Choat was involved in a campaign to speak to school children about the danger of feeling indifference to the war and to teach them the importance and nobility of self-denial and self-sacrifice. He was awarded the Military Medal ‘in recognition of gallant conduct and determination displayed in escaping’ on 5 May 1919. Choat married Lulu Lillian Fox on 28 December 1919 at St. Mary Magdalene’s church, Adelaide. They lived at Unley Park and had one child – a daughter, Venloe Beth, born 21 January 1921. Choat died 15 January 1977. He is buried at Centennial Park.